With leftover eggs whites from making flourless chocolate cake earlier in the week, and CSA produce filling all the drawers and shelves in the fridge, the comforting solution to use these nutritious ingredients came to me: frittata! 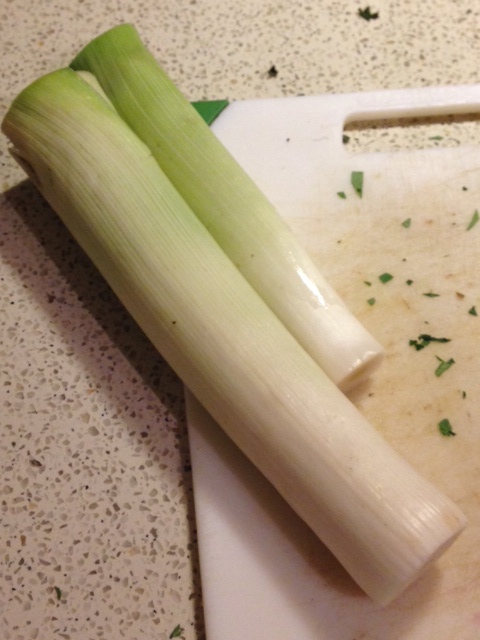 I had to purchase leeks, but they are usually available at any grocery store year-around. The egg whites last in the fridge for even more than a week, so when the night came for a fast, one-dish meal—or actually a great main plate with a seasonal side soup (Roasted Carrot and Tahini Soup with Spicy Chickpeas) in my case so I could indulge in even more homecooked masterpieces—this frittata was perfect for using my fresh produce and leftovers! I always receive at least three bundles or bags of leafy greens in my CSA share, from bok choy to Russian kale. I also receive the whole beet and turnip plants, so I experiment cooking with these colorful and soft greens. I eat as much as possible, especially since leafy greens are an especially good source of magnesium. This mineral helps lower our risk of sudden heart failures and helps our heart maintain regular heart rhythm. At sufficient levels, blood vessel muscles relax, reducing risks of blood pressure build up. Magnesium also helps to prevent calcification in your arteries in case your intake of calcium is too high. Egg whites also help your cardio system by having zero cholesterol. 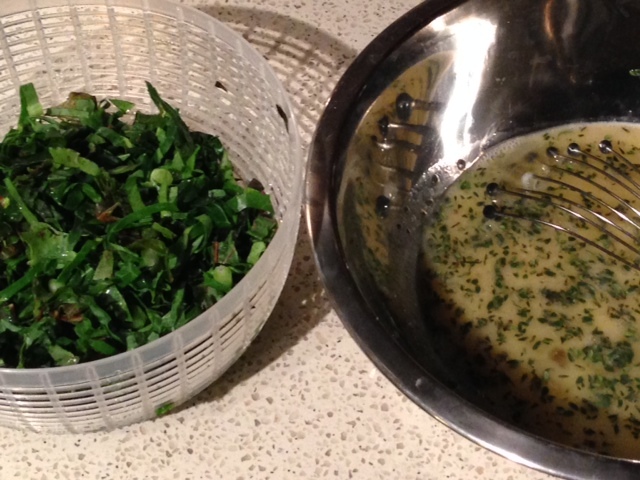 So leafy greens, meet egg whites! The egg mixture for this frittata is a healthier alternative, lowering the fat content and cholesterol levels to zero. modified from: Carroll, John Phillip. “Summer savory spinach frittata.” The Mayo Clinic Williams-Sonoma Cookbook. Menlo Park: Oxmoor House, 2002. In a bowl, whisk together eggs, fresh herbs, and water. In a large frying pan over medium heat, heat the oil. 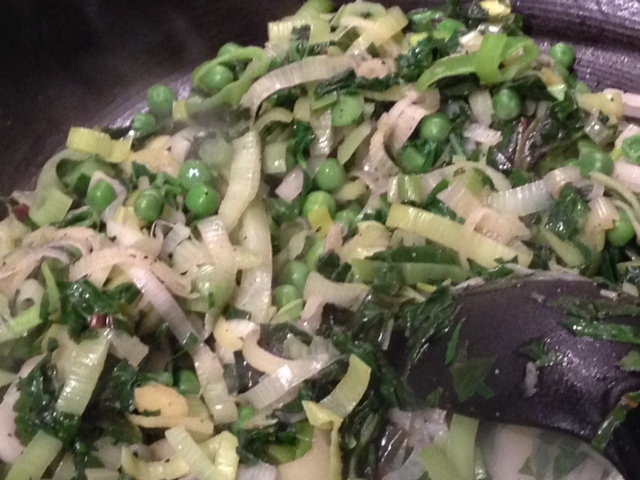 Add the greens, leeks, peas, and pepper. Cook, stirring frequently, until the leeks are tender, about 10 minutes. Pat down vegetables into an even layer. Pour in the egg mixture. Cook, shaking the pan occasionally to keep the frittata from sticking. Running a rubber scrapper around the edges of the pan will help release the frittata from the pan as well. Cook for about one minutes, then cover. Turn down heat to low and cook for about another two minutes, or until the eggs are set around the edges but soft and runny in the center. Uncover and sprinkle with the cheese and bell pepper. Cover and cook until the eggs are completely set and the cheese is melted, about 4 minutes longer. To serve, cut into wedges and serve immediately. Wine advice for a recipe is always a bonus, right? For this frittata, as it’s quite light and savory, I recommend Spanish Verdejo or White Bourdeaux for whites, or Chilean Carmenere or Italian Montepulciano d’Abruzzo. So go to the wine shelf and uncork (or twist off) a bottle, to make a whole cardio package. Whole-wheat pita is another good heart healthy companion (and if you’re like me, bread is a non-negotiable with dinner). 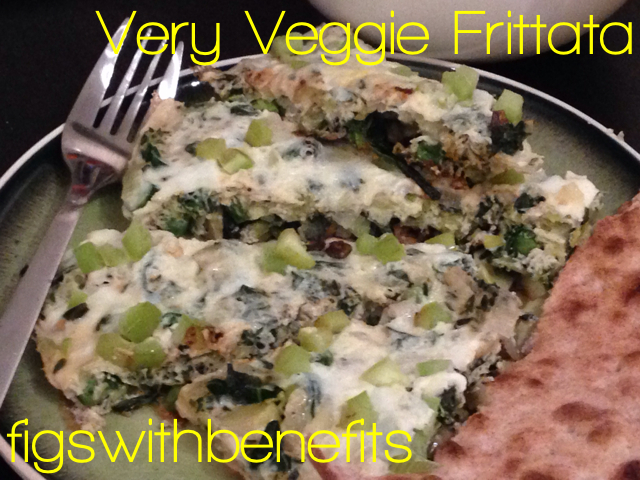 If you can’t finish the frittata during the first sitting, heat it up from breakfast the next day for a great start! Bon ap, to cardio health! I’m on a quest to ease my breathing; I’ve noticed I can breathe heavily after walking up a few flights of stairs, once I get off the treadmill, or jumping back on the bench after a shift on the ice. I know that more exercise will help, strengthening my cardiovascular system and muscular system. The solution is never a single shot, though. I know my nutrition has to help, too. Will this sitch be a tough nut to crack? Nope! The second prong to my solution ended up greeting me at the Gaithersburg Farmers’ Market, held every Thursday afternoon. This visit wasn’t my first to this location, but I was delighted to finally see a vendor who was selling something different than just farm produce. Rather, she had 14 oz. containers, 2 oz. packets, and variety packs of homemade granola! She even had muffins and cookies using her granola for sale. I tried the Tropical Rum variety, crunching into the whole grain rolled oats, saturated with potent aromas and simple flavors. 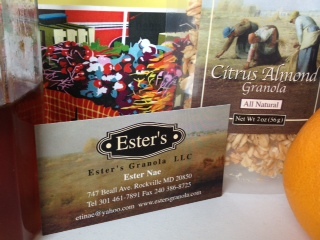 Ester, the founder of the company Ester’s Granola LLC, based in Silver Spring, MD, kindly told me about all of the advantages of her granola over commercial varieties, which I had steered away from due to their high caloric and sugar content. Five varieties (with fruit and nuts; peanut butter; maple pecans; citrus almond; tropical rum) and one gluten-free variety (with fruit and nuts) → look for other varieties to come out to highlight seasonal ingredients! Before leaving, I purchased two packets, and now I am absolutely nuts for Ester’s Citrus Almond Granola. I eat some daily for the cardio benefits. Oats contain avenanthramides, antioxidant compounds that actively function in many ways to improve your cardiovascular system. Let’s pair these oats with a friend to really get your body digesting a bundle of antioxidants! So oats, meet oranges. This fruit has the antioxidant hesperidin, which improves blood vessel function and reduce problems for cardiovascular disease. The oats and orange duo should help me conquer my quest for better cardio health. 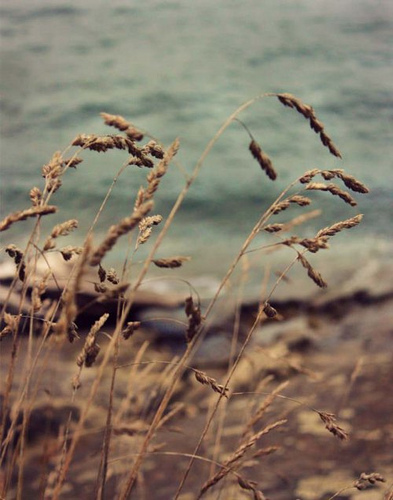 Here’s a recipe Ester provided us from her creative repertoire of recipes for the O&O combo! Cut away the peels from oranges, leaving no white pith. Segment the oranges. See picture above. Cut around the skins of the orange segments, leaving them attached to the orange core, and taking away only triangles of fruit. In a large bowl combine the spring mixed greens, orange segments, Gorgonzola cheese, and Ester’s Citrus Almond Granola. 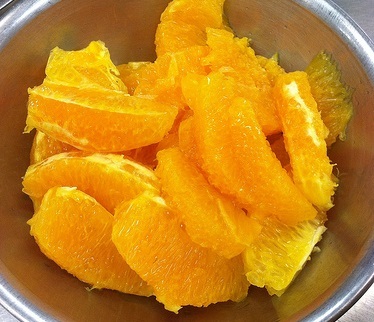 In a small bowl, combine the oil, vinegar, zest, orange juice, honey, salt and pepper. Whisk to combine. Drizzle the dressing over the salad, toss, and serve immediately. I’m looking forward to better control of my breathing as I incorporate these ingredients in my diet. Watch out stairs and gym! Bon ap, to cardio health!